The man who would become one of the founding figures of modern sea angling was born in 1870 - fathered by the English agent of Sultan Mulai-el-Hassan of Morocco - and was educated at Clifton College before going to the University of Rostock to study chemistry. He was a keen fisherman from the moment he was old enough to hold a rod and spent mpst of his unversity days doing anything except study his chosen subject. On his return to the UK, Aflalo took up sea fishing on a serious scale, taking conger, pollack and bass, and blue shark; and he helped to found the British Sea Angler’s Society in 1893, the first meeting being held with C. H. C. Cook, better known as John Bickerdyke, in the chair. It was the beginning of a lifetime in sea angling in which Aflalo would come to know almost every significant player - including the great C.F. 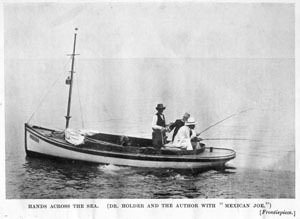 Holder (no less a writer than Aflalo), who is seen boat fishing with him in 1909. After marrying in 1895, Aflalo, who became a Fellow of the Royal Geographical Society, set off on a lifetime of travels, which took him all over the world. He did Red Cross service during 1916 in Volhynia in the Ukraine and was appointed British Vice Consul in Basle in 1917, where he might perhaps have ended up following a similar career to his father had he not died within a few months, perhaps of influenza. Aflalo's books, of which there are many, tell stories of destinations which seem exotic even now. He was one of the first anglers to concentrate on sea fishing and his descriptions of people and places are often as interesting as the stories of the fishing itself. The pages are littered with adventure and lines like ‘My only fishing in the interior of that fascinating country was for small barbel in Wad Tensift not far from Marrakesh’ which takes some beating as an introduction to a passage on touch ledgering with grasshoppers. One of the many things that made Aflalo popular as a writer, apart from the way he seamlessly weaved technical advice into great stories, was that he wasn’t afraid to admit failure – in fact, some of his best tales are about days when he didn’t catch anything. His story of tuna fishing in Madeira in 1905 is a fine example; after much preparation, the biggest thing he boated was a turtle and that was asleep when they nabbed it. Despite several very determined attempts, he never landed a tuna, yet the other hand, when Aflalo went to Boca Grande in Florida in 1906, he landed a couple of hundred pound tarpon within an hour, so the man knew what he was about – and there again, the writer in him supplies the unforgettable line ‘…the tarpon is as elephants to snipe, and the sea-angler likes his big game as well as the shikari.’ By then Aflalo was fishing in distinguished company, the fishing record at Boca Grande including one E. Vom Hofe, who, for what it is worth, caught a third the number of fish for much the same effort. Aflalo did a great deal to make sea angling angling the popular sport it is today. He was interested in just about everything and was every bit as much of an amateur naturalist as Frank Buckland, so if you have never read them, his books are an education. A generation was inspired to go out and fish in the salt after reading his work. You can read Aflalo's greatest work, The Salt of my Life, in the library for free, just follow this link to download a copy. This biography is condensed from Andrew's Angling Giants - you can read more about the book if you click here.